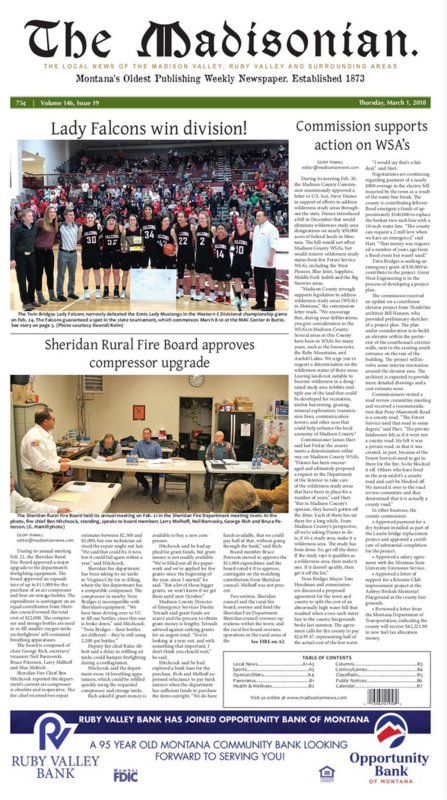 Twin Bridges Council approved two preliminary resolutions on Feb.13 to raise town water and sewer rates, subject to final council approval following advertisement and public hearings. The town seeks to raise rates to balance its water and sewer accounts and pay for upgrade projects. ENNIS – According to a press release from the Madison County Sheriff’s Office, at approximately 12:44 a.m. on Feb. 19, Madison County Sheriff’s Department responded to a 911 call of a disturbance at the Sportsman’s Lodge in Ennis. Upon arrival, deputies learned that one person had been shot in the altercation. ENNIS -- The Town of Ennis has a new draft zoning ordinance, which is under review by Ennis council and available for public inspection. If enacted by council following public hearings, the draft would replace the current town zoning ordinance in its entirety. Dalton Furie Depaoli failed to appear at the Madison County Courthouse on Feb. 12 citing a health issue. Depaoli is being charged with one count failing to register as a violent offender. His case was continued until Feb. 26. Sheridan Schools Superintendent Micheal Wetherbee is once again seeing his name in lights. U.S. Sen.
BOZEMAN – The snowpack across Montana remains in good shape starting the month of February with all basins in the state at near to above normal for the date. In fact, Montana is the only state in the 12 western U.S.
What matters more than water? Read more about What matters more than water?